The Yankees were two innings away from being swept to the precipice of fourth place when the offense finally started to hit…or, rather, get hit. Trailing 2-0 in the top of the 8th, starter Brandon Morrow started the inning by hitting Francisco Cervelli in the shoulder. Then, reliever Scott Downs followed up by plunking Brett Gardner on the forearm to give the Yankees their most formidable rally of the game. 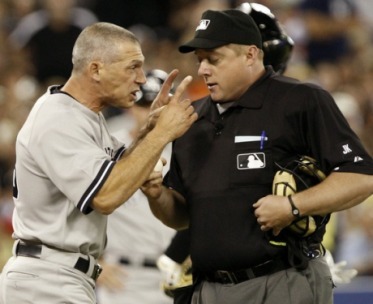 Joe Girardi makes a few points to home plate umpire Bruce Dreckman, whose erratic strike zone drew the ire of both teams. With the tying runs on base, Derek Jeter worked Downs to what seemed like a 2-1 count, but home plate umpire Bruce Dreckman, whose strike zone was erratic all game, called the third pitch a strike despite it being well off the outside corner. Ironically, the poor call turned the game in the Yankees favor because the next pitch was in a similar location, but instead of taking it, Jeter slashed it down the right field line for a double. The clutch hit scored Cervelli and sent Gardner to third, but things got a little anxious after Swisher was called out by Dreckman on a check swing that replays clearly revealed was held. The frustration of Dreckman’s mounting bad calls led Girardi out of the dugout for an argument that culminated in his ejection. Meanwhile, Cito Gaston had a tough decision to make, and like many managers before him, opted to walk the struggling Mark Teixeira to face Alex Rodriguez with the bases loaded (Arod had been 5-5 with 18 RBIs in that scenario). Before the Frasor/Arod confrontation could be decided, however, a wild pitch that squirted about 15 feet from Jose Molina allowed Gardner to slide home with the tying run. Perhaps distracted by not having the bases loaded, Arod then took a called third strike down the middle, setting the Yankees up for another wasted opportunity. Gaston first had another decision to make, and inexplicably decided to let the right handed Jason Frasor face Robinson Cano, who promptly slashed a single to left that scored both Jeter and Teixeira. The reason the punchless Yankees were able to hang around in the game was because Javier Vazquez was brilliant once again. After watching the Jays do most of their damage in the series off of the fastball, Vazquez attacked the Toronto hitters with an over abundance of off speed pitches. Nearly 60% of pitches thrown by Vazquez were of the off speed variety, including a combined 45% that were either a change or curve. Ironically, the pattern used by Vazquez was the same one that many believe caused his early season struggles, but against the aggressive, fast ball hunting Jays, it was a recipe for success. For the first 5 2/3 innings, Vazquez racked up eight strikeouts with out giving up a hit. After walking Adam Lind, however, Vazquez hung a slider to Vernon Wells, who promptly hit deep into the left field seats to give the Jays a 2-0 lead. At the time, it seemed as if one mistake would Vazquez a hard luck loser because the Yankees didn’t seem to have a chance against Morrow, who used a fastball that averaged 96mph to dominate the Yankee batters. After two games of facing change-up masters in Cecil and Romero, Morrow’s heat had to seem like lightning. After Gardner’s one out triple in the third, Morrow retired the next 13 batters, a string that was broken when Cano singled with two outs in the seventh. Despite handling the Yankees with such ease, however, the Yankees’ less than thunderous rally in the 8th set him up on the hard luck end of the game. Unable to reward their young starter with a win, the Jays did score a run off Joba Chamberlain in the 8th inning before Damaso Marte struck out the dangerous Adam Lind to end the inning. Then, what could have been a lost weekend in Toronto was avoided when Marian Rivera, who did not appear in yesterday’s 14 inning marathon, easily retired the side on five pitches. Just as importantly, after struggling with some diminished velocity following his time missed, Mariano was once again dialing his cutter up to 93mph. On the one hand, the Jays have to be happy with a series win against the Yankees (and also happy with the increased weekend attendance that saw it), not to mention the continued development of Morrow. However, you can’t blame them if they feel a little bit bitter about giving this game away in the eighth, especially after seeing the bullpen blow two games to the Rays earlier in the week. With a better bullpen, the Jays could have polished off a perfect 6-0 record against their AL East rivals. The Yankees, meanwhile, have to be thrilled to steal this game. Their offense was anemic all weekend, and it was only with considerable help from the Jays bullpen that they were able to mount a late rally in today’s game. Still, the win send them into the off day feeling good and setting up a week that will feature six games against last place teams. Alex Rodriquez was removed from the game in the bottom of 9th inning due to mild tightness in his right groin. Ramiro Pena, who replaced Arod at third, made a great play on a tricky hop to retire the first batter in the ninth. According to Girardi, Arod is expected to play on Tuesday. Since returning to the rotation after being skipped in early May, Vazquez is 3-2 with a 2.81 ERA. In Vazquez’ 10 starts, the Yankees have scored 24 runs while he was still the pitcher of record. With 11 strikeouts in today’s game, Yankees’ hitters tied a franchise record for most Ks recorded over two games. The 27 strikeouts by Yankees batters over the weekend matched the same total recorded by the 1992 team on July 3-4 and the 1964 team on September 6-7.